Owning a good step ladder can make life easier in a number of common (and uncommon) chores. From cleaning windows and gutters to changing bulbs and cleaning the display space above your kitchen cabinets, there are plenty of times when the best ladder for the job will also be your best friend. The most common sizes you’ll likely need are 6 or 8 foot, and we’ve compiled some of our favorites here to make shopping for the best fit easy. Some models have many height variants available, so if you need a different size (5, 7, 10, or 12-foot), you’ll likely be covered there as well. Louisville Ladder FS1506 Fiberglass 2 to 12 ft. 20 lbs. 300 lbs. Little Giant Flip-N-Lite Aluminum 4 to 6 ft. 14 lbs. 300 lbs. Litte Giant Select Step Aluminum 5 to 10 ft. 31 lbs. 300 lbs. Louisville Ladder FS4006 Fiberglass 4 to 8 ft. 16 lbs. 225 lbs. DeWalt DXL3810 Fiberglass 6 to 8 ft. 28 lbs. 500 lbs. Werner 6208 Fiberglass 4 to 12 ft. 22 lbs. 300 lbs. Louisville Ladder AS3006 Aluminum 2 to 10 ft. 18 lbs. 300 lbs. What Size Step Ladder Do I Need? Aluminum vs Fiberglass – Which is Better? Can a Step Ladder Be Leaned Against a Wall? Built for superior safety and stability, the Louisville Ladder FS1506 is the best 6-foot ladder you’ll find. Every step on this 300-pound capacity workhorse is secured by six large-headed steel rivets to ensure superior durability. The molded fiberglass top includes a recessed tray and molded in slots to keep your tools in easy reach. Protected spreader braces and the exclusive SHOX system help prevent damage from accidents or mishandling. If you’re looking for a different height, this Louisville is also available in 2, 3, 4, 5, 8, 10, and 12-foot variations. Once you have this ladder in your garage, you likely won’t need another for a good decade or more. Owners report the ladder is both durable and sturdy, with contractor-grade construction. It’s also high enough to reach most gutters without becoming too cumbersome to carry. There’s a very common complaint about this ladder, which tends to be the sole sticking point. Numerous consumers have received refurbished ladders, often in a brand new box. Be sure to purchase from a well-known retailer and inspect your ladder as soon as it arrives to ensure you have a new product. This ultra lightweight step ladder weighs under 14 pounds, yet carries a Type 1A 300-pound ANSI duty rating. The base has a width of 1 foot, 7 inches and features a large, comfortable standing platform. Despite this, the Flip-N-Lite keeps a slim storage profile. Available in 4, 5, and 6-foot configurations, apartment owners love this ladder, as it can reach high ceilings and provides great balance. The Flip-N-Lite easily opens with one hand and offers deep, comfortable steps, making it one of the safest ladders for older folk and those with balance issues. The standing platform makes you feel extra secure so you don’t have to strain your muscles trying to stay balanced. Those who don’t use ladders very often find it super easy to use. It provides handholds and a place to keep screws and other small items so you don’t have to hold things while changing a lightbulb. Some users actually now find painting enjoyable with the Little Giant! A few owners have reported receiving used or damaged ladders so make sure to purchase from a reputable retailer. Additionally, the overall footprint is pretty large for its size, so be sure you have space before using. 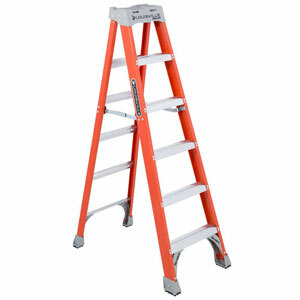 This 300 pound rated step ladder can be adjusted between 5 and 8 feet as needed using incremental telescoping. A larger 6 to 10 foot version is also available. The ability to change the height of each side separately make it easy to use on surfaces and uneven ground. A 120 square inch standing platform and AirDeck work station provide stability and comfort. Best of all, the Tip & Glide wheels allow you to move this ladder with minimal effort, which is a good thing since it does weigh about 30 pounds. But that additional weight means you won’t have to worry about a flimsy frame with this step ladder! The locking mechanism holds tight and makes an audible click so you know when it’s set. Its higher weight capacity and durable design make this an excellent choice for larger individuals. 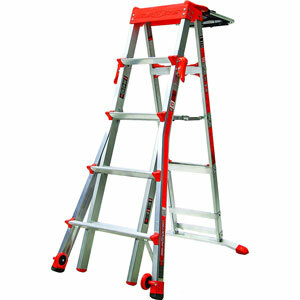 The wheels on this ladder are less useful on uneven ground and tend to work best on a concrete surface. Additionally, it weighs more than a lot of other ladders on this list, so you may wish to take that into account before purchasing. 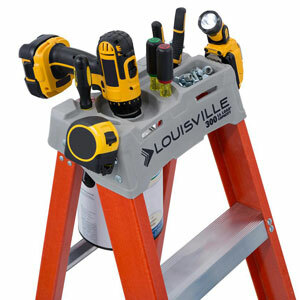 Our second entry from Louisville Ladder, this lightweight six-footer offers a 225 pound capacity. High-quality, non-conductive fiberglass construction makes it the best ladder for electrical work. This popular model is also available in 4-foot, 7-foot, and 8-foot variants. Aluminum angle feet include a thick, slip-resistant rubber tread on all four legs. Topping off the list of features (literally) is an exclusive Pro Top system that includes curved front, magnet tray, drill and tool slots, hardware tray, holder for a pipe or 2×4, and paint bucket holder. The FS4006 is perfect for cleaning gutters and ceilings, yet weighs a fraction of what you’d expect. The sturdy design and ability to hold all your painting supplies and tools make this one of the best step ladders for its size. 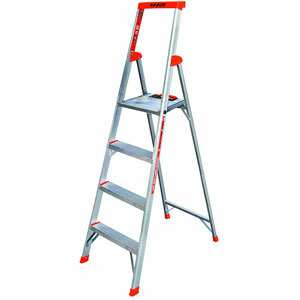 Several consumers have received refurbished ladders when ordering a new one. In many cases, the box is in top condition, while the contents are used. Be sure to examine your ladder for signs of previous use upon arrival. 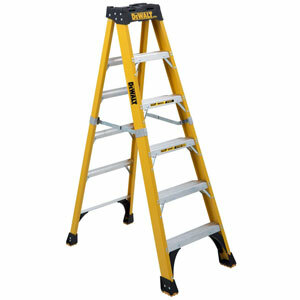 Known more for their power tools, DeWalt quality is shown in this heavy duty step ladder. Tested to bear up to 500 pounds, this tough ladder has wrap around internal spreaders and non-marring, slip resistant heavy duty shoes for extra durability and stability. It’s available in both 6-foot and 8-foot models. The top includes a magnet and multiple tool slots so you won’t have to fumble for the right tool. 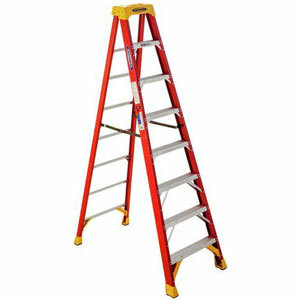 Meanwhile, the ladder includes a 25 percent increase in step surface for a more comfortable experience. The key selling point of the DXL3810-06 is its incredible weight capacity. Not only is this a major benefit to larger individuals, the added stability makes it a sure bet for lighter users who want that added security. While this does translate into a little extra heaviness, the difference is easily noted the moment you climb it as there is almost zero wobble or flexing. Many users have reported getting a ladder with plastic molded top instead of aluminum. Whether this is a variant, updated model, or manufacturing error is unknown. If this is an issue, be sure to check with the retailer before purchasing. Probably the best 8-foot ladder in the group, the excellent Werner 300 pound rated stepladder has double-riveted, slip resistant Traction-Tred steps for improved safety. It’s available in 6 additional heights which are just as good. 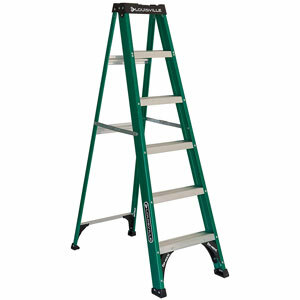 EDGE bracing and heavy-duty internal spreaders make the ladder extremely sturdy and durable. A holster top features a lock-in accessory system so your tools won’t be at risk of falling, while a hanger allows you to keep your paint can within reach. Those worried about a wobbly ladder will welcome the 6208, as it’s especially sturdy. The frame is very well-built, allowing it to take a real beating. The ability to keep tools secured is an appreciated feature for those who have to do extensive work while on the ladder. Many professionals swear by Werner ladders and won’t use anything else. While solid, this ladder is a bit heavier than others on our list so it may be a little less portable than others for some users. Several owners have also reported receiving used products, although this is less common than with some other ladders. 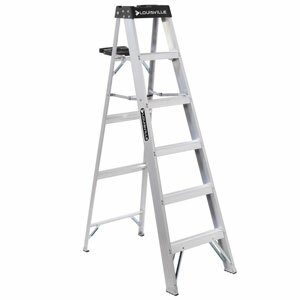 Rounding out our list is this 6-foot, 300 pound capacity aluminum step ladder from Louisville Ladder. Designed to meet or exceed the standards of ANSI and OSHA, you can be assured this lightweight ladder is safe to use in both home and commercial environments. While the 6-footer is the most popular, this model is also available in six additional height variants. Angled slip-resistant rubber feet, center-pull spreader braces, and steel gusset bracing make this an extremely sturdy ladder. Literally topping off the features is the Pro-Top surface with trays and holders for all of your tools. Having the AS3006 around can make just about everything easier. Perfect for a wide range of tasks, owners have found it useful for home, commercial, and even automotive applications. The aluminum construction makes it lighter than most fiberglass models without sacrificing durability. For some reason, a few consumers have been shipped the FS4006 instead of the AS3006. This can be a frustrating experience, since the two models are vastly different and returning can be a pain with some retailers. Be sure the model you receive is the one you ordered. Owning a good step ladder is important, but you might not have considered the difference between a good model and a great one. Here are some considerations to make when purchasing and using your step ladder. This largely depends upon the job. For example, gutters tend to be at least 9 feet above ground, so an 8 foot step ladder is ideal. A 6 foot step ladder will work for window cleaning and reaching most ceilings. As a general rule, you should never go above the second step from the top, so the ideal step ladder will allow you to reach the height of your target when you add your height to the height of the step ladder (from the second step down – NOT from the top). When dealing with heights taller than 12 feet, it’s best to go with an extension ladder, while a step stool works well for when you only need a couple feet of boost. Step ladders form the ideal middle ground. When it comes to safety, you never want to cut corners. Fiberglass is sturdier and non-conductive. Making it perfect for electrical work. However, aluminum is lighter and cheaper. For a step ladder, which is generally light enough to carry on its own, we recommend spending a few extra dollars for fiberglass to ensure the extra safety and durability. OSHA safety standards forbid the use of ladders in ways they aren’t designed. Step ladders are designed to be self-supporting, and leaning them against a wall will remove much of their stability. The best option is to either use a leaning ladder (such as an extension ladder) or place the step ladder so that one side is flush with the wall in question. It can be tricky to use a step ladder on stairs, but it can be done. The key is to first ensure your ladder is sturdy and have good non-slip feet. You will also need to be able to adjust the front and back feet separately. Place the front legs on the lower stairs and rear legs on the upper one. Lock the spreader and use caution, calling for a spotter if you feel even the slightest amount of instability. A good alternative that can be safer than the method above is using a Ladder-Aide. This device allows you to create a level surface to place your step ladder on. You can easily adjust the height to match your riser height.